It's hard not to picture Mickey Rooney as an affable teen. The legendary movie star died Sunday at the age of 93, but many fans remembered him for the roles that made him beloved decades ago. Whether it was putting on a show with costar Judy Garland, or offering advice as the kindly retired horse jockey in "The Black Stallion," Rooney lit up the screen and won hearts. 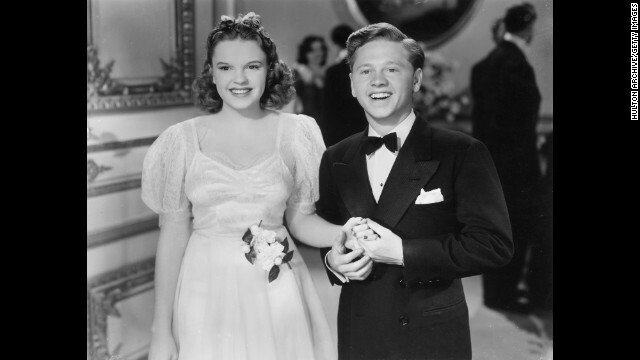 The world first met teen Andy Hardy in the 1937 film "A Family Affair," the first in a series which would go on to make Rooney a star. His role as the son of Lionel Barrymore's Judge Hardy made him one of the first teen idols. Fans fell in love with the chemistry between Rooney and Judy Garland. In the musical "Babes in Arms" the two play a pair struggling to make it in show business. It's pretty magical. Rooney made the transition to television with his own NBC series. He played studio page Mickey Mulligan, who aspired to become a big star. Admirers of his Andy Hardy films were built-in fans. The actor won a new legion of fans with his portrayal as retired jockey Henry Dailey in the 1979 movie "The Black Stallion." The role earned him an Academy Award nomination for best supporting actor. What was your favorite Mickey Rooney role?